First RFC aerodrome in France. 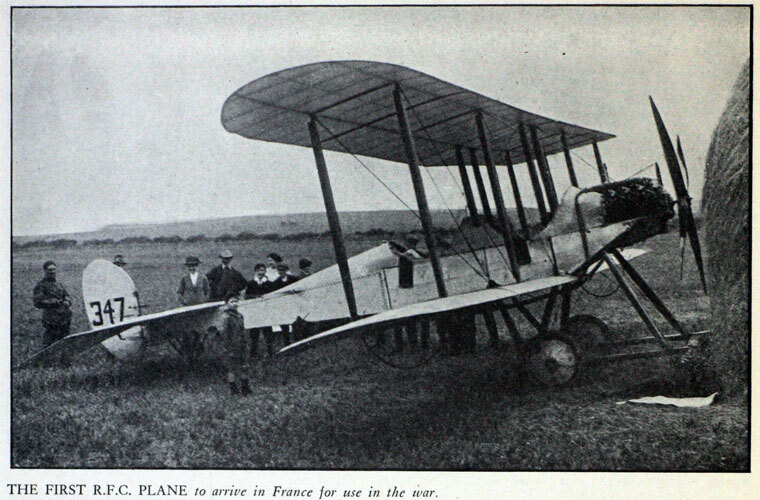 First RFC plane in France. 1912. No 3 Squadron RFC. A. E. Burchardt Ashton is second from the right. 1912 After prolonged discussion on the Committee of Imperial Defence the Royal Flying Corps was constituted by Royal Warrant on 13 April 1912. It absorbed the nascent naval air detachment and also the Air Battalion of the Royal Engineers. It consisted of two wings, with the Military Wing making up the Army element, and the Naval Wing, under Commander C. R. Samson. A Central Flying School staffed by officers and men of both the navy and the army was created at Upavon for the pilot training of both wings, and opened on 19 June 1912 under the command of Captain Godfrey Paine, a naval officer. The naval wing, by the terms of its inception, was permitted to carry out experimentation at its flying school at Eastchurch. The Royal Flying Corps, although formed of two separate branches, allowed for direct entry to either branch through a joint Special Reserve of Officers, although soon the Navy inducted new entries into the Royal Naval Reserve. On 1 July 1914, the Admiralty formed the Royal Naval Air Service, moving the Naval Wing of the Royal Flying Corps under Admiralty control. WWI The Royal Flying Corps (RFC) was the over-land air arm of the British military during most of the First World War. During the early part of WWI the RFC's responsibilities were centred on support of the British Army, via artillery cooperation and photographic reconnaissance. 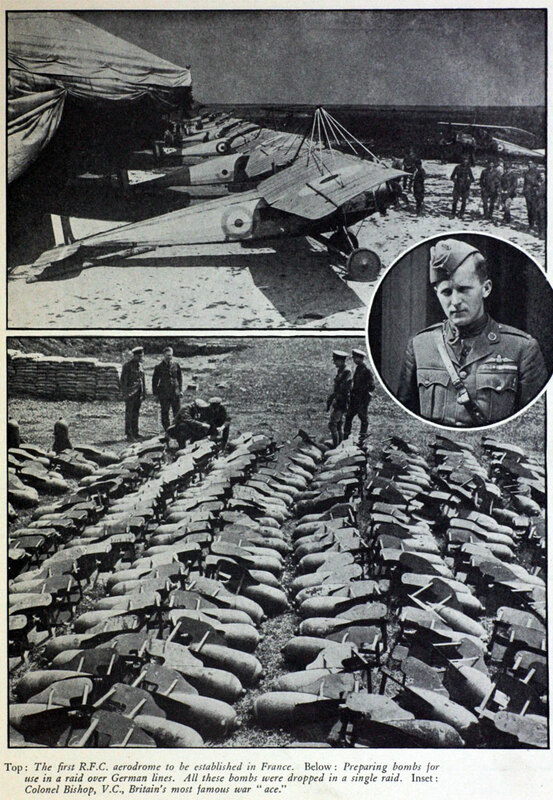 This work gradually led RFC pilots into aerial battles with German pilots and later in the war included the strafing of enemy infantry and emplacements, the bombing of German airfields and later the strategic bombing of German industrial and transportation facilities. At the start of World War I the RFC, commanded by Hugh Trenchard consisted of five squadrons – one observation balloon squadron (RFC No 1 Squadron) and four aeroplane squadrons (RFC No 2 and No 3 Squadrons were the first fixed-wing flying squadrons in the world). These were first used for aerial spotting on 13 September 1914, but only became efficient when they perfected the use of wireless communication at Aubers Ridge on 9 May 1915. Aerial photography was attempted during 1914, but again only became effective the next year. By 1918, photographic images could be taken from 15,000 feet, and interpreted by over 3,000 personnel. Parachutes were not available to heavier-than-air pilots of the RFC - nor were they used by the RAF during the First World War - although the Calthrop Guardian Angel parachute (1916 model) was officially adopted in late 1918. On 1 August 1915 the Royal Naval Air Service officially came under the control of the Royal Navy. On 17 August 1917, General Jan Smuts presented a report to the War Council on the future of air power. Because of its potential for the 'devastation of enemy lands and the destruction of industrial and populous centres on a vast scale', he recommended a new air service be formed that would be on a level with the Army and Royal Navy. The formation of the new service however would make the under utilised men and machines of the Royal Naval Air Service (RNAS) available for action across the Western Front, as well as ending the inter-service rivalries that at times had adversely affected aircraft procurement. On 1 April 1918, the RFC and the RNAS were amalgamated to form a new service, the Royal Air Force (RAF). The RAF was under the control of the new Air Ministry. After starting in 1914 with some 2,073 personnel, by the start of 1919 the RAF had 4,000 combat aircraft and 114,000 personnel. 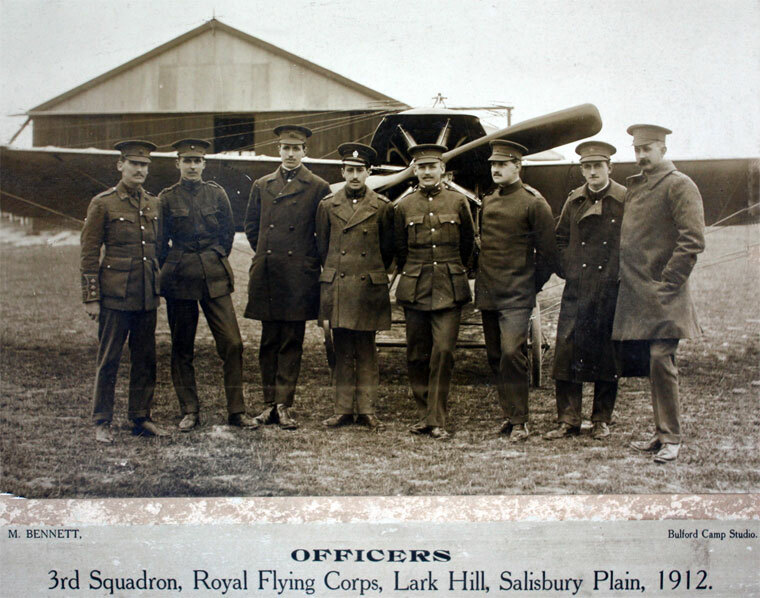 No.2 Squadron(RFC) was formed at Farnborough on the 13th May 1912 from a detachment of No.2 (Aeroplane) Company of the Air Battalion, Royal Engineers and remained at Farnborough until moving to Montrose in 1913. ↑ The War in the Air, Volume 1, by Sir Walter Raleigh and published in 1922 as the first of six volumes which formed the official history of the Royal Air Force. This page was last edited on 27 August 2018, at 11:22.